Jesus knows the hearts of mankind, so He knew they were hungry. Jesus will supernaturally multiply the lad's lunch. He will be the Source of the physical bread and fish through multiplication, but the disciples will distribute it. The disciples could only give what they received from Jesus. The multitudes received and ate the physical bread, but Jesus will use it to show that He is the Living Bread of heaven sent of God who will feed their spiritual, eternal life. We can't sustain our spiritual life without the Living Bread of Life – Jesus. When the Word becomes flesh in us through simple obedience, it becomes “living” in us just as the whole Word of God is “living” in Christ because He obeyed it fully and completely. Jesus wanted this crowd – and us – to see with spiritual eyes, not physical. The spiritual Word of God is food for our soul and spirit when it is eaten by the one receiving it. Jesus used the temporary value of physical food to illustrate the eternal value of spiritual food – the satisfying Bread of Life that comes only through Jesus empowered by the Holy Spirit. We have to desire His bread and meat. Jesus will use this miracle as a prelude to revealing that He is the Bread of life sent from heaven. First the “natural” message. Then the “spiritual message. After the bread and fish were brought to Jesus, He told His disciples to seat the masses in groups of 50 or 100. There is always a message in anything Jesus spoke or did, including numbers. No doubt this was done to keep order and make the distribution more manageable – avoiding confusion. They were all going to eat from the same food that came from Jesus. When zeros are added to numbers, it means in greater measure. The numbers 50 and 100 would spiritually mean “greater grace” (5) and “greater Divine order.” (10). Simple obedience to Jesus' Word of instruction brought the abundance. Jesus will show all present His multiplying power. There must have been a grassy knoll on the mountainside where Jesus had His disciples tell the crowd to sit and rest. Springtime (the time of Passover and sacrifice for sin) is the time of “new life.” The grass would be green, fresh and new. Green is the color of everlasting life. Jesus will feed the multitude with the bread and meat that brings everlasting life. He is the perfect Passover Lamb that was sacrificed for the sin of the whole world. Only Jesus can satisfy and fill! The bread and meat will renew the strength of the multitudes so they can continue their journey to God's Holy City. This crowd of Jews on their way to celebrate Passover in Jerusalem accepted the physical bread given by Jesus, but sadly the majority of them rejected the Living Bread (Jesus) who came down from heaven like the manna in the wilderness. The bread in the wilderness was not "living" bread. Jesus looked up to the Provider of all things – His Father – and gave thanks for the meager provision given to Him by the lad. Our Heavenly Father loves a thankful heart no matter how great or how small His provision. “Let the peace of God rule in your hearts..........and be thankful.” Colossians 3:15 We must learn to be thankful on a daily basis for all of God's blessings. In the other gospels, it says that Jesus blessed the bread and meat, broke (divided) it, and gave it to His chosen disciples to give to the crowd. In all three of the other gospels, Jesus said to His disciples, “You give them something to eat.” Jesus affirmed this again in the John 21:15 after His resurrection when He told Peter three times to “Feed My sheep.” In John 21, Jesus fed His disciples bread and fish again. Here in John 6, Jesus distributed the bread and meat Himself just as He did with His disciples in John 21 at the great catch of fish. In feeding the multitudes, the disciples had to totally depend upon Jesus who rightly-divides the Bread and Meat of His Word. 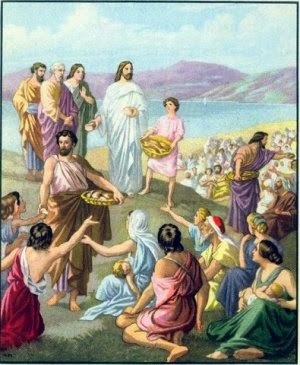 Then they could distribute the rightly-divided bread and meat to others. There was a never-ending supply until all were fed and satisfied. Each person could eat as much as he or she wanted. In other words, as much as they desired. This is true also with the written Word of God that reveals the Living Word of God – Jesus. We can eat as much as we want until we are satisfied, and it never runs out. There is fresh manna in the Word for us at all times. The feeding of the bread is foreshadowed in the story of Joseph in Egypt. The life of Joseph is a type and shadow of Jesus. To reveal this to you would take another whole teaching so I will give you a brief overview. Joseph had the “saving” grain in Egypt that would feed the multitudes. If you know the story, Joseph in his wisdom saved the grain during the abundance for a day when there would be a famine. All had to come to Joseph for food when the famine came. Joseph is the right hand man to Pharaoh in the land of Egypt, as Jesus sits at the right hand of the Father. God also saved the grain -- Jesus, His Seed -- for a day when there was a famine of the Word of God in the Promised Land. God had not spoken for over 400 years before Jesus came into the world. Joseph's father (Jacob – the father of the 12 tribes of Israel), his brothers and the whole household of the father came to Joseph in Egypt for grain. “Joseph provided his father, his brothers, and all his father's household with bread, according to the number in their families.” Genesis 47:12-14 Again, God multiplies the bread and feeds all of God's people. Jesus provides bread to the whole household of Father God. As Joseph was the favored son of father Jacob, Jesus is the Favored and Only Son of Father God who will feed all with His spiritual bread and meat -- both Jew and Gentile. Each of Jesus' twelve disciples had a basket of bread and meat to distribute to the hungry. So does every believer in the Bread of Life – Jesus. Jesus multiplied the bread and meat in His disciples' baskets first. What was in the hands of the disciples multiplied as they gave it away and kept multiplying until all were filled. Jesus had taught His disciples. They were carriers of His spiritual Word. It is sharing of the Anointed Word that brings multiplication until all are satisfied and filled. Jesus uses the Bread and Meat of His Word to establish His Divine Government on earth. We are His receptacle through whom He will feed the spiritual bread and meat of His Word. Twelve is the number of Divine Government. Twelve also represents all of God's people – twelve tribes of Israel and twelve original disciples – who began the establishment of God's spiritual Kingdom on earth. As Jesus said to the Samaritan woman at the well, “Salvation is of the Jews.” The Savior of the world had to come through the Jews to fulfill scripture. There were twelve full baskets after all were fed and satisfied. There was as much leftover at the end as there was in the beginning -- twelve full baskets. Not one piece of the bread or meat was wasted or lost. The Word of God is never wasted. It accomplishes that for which God sent it. Jesus said that He is the “the Alpha and Omega; the Beginning and the End.” Jesus like God operates in fullness. He is the fullness of Truth. The Bread and Meat of God's Word never runs out. The written Word became the Eternal Word in Christ. Jesus began building His Temple in the hearts of mankind through His chosen twelve Jewish disciples. When His disciples trusted and obeyed Jesus, He supplied food for the hungry. It was in the rightly-dividing and sharing that the bread and fish multiplied! Jesus wants His followers to do the same today. We must receive Truth from Jesus and the Spirit of Truth and then share it with others. This brings the multiplication. A sign of our love for Jesus is our willingness to feed others the good news of salvation through Jesus Christ and the Truth that He has so graciously shown us. Jesus is concerned about both our physical and our spiritual needs. He is the only One who can satisfy and fill. He will use this miracle of multiplying the bread and fish to reveal Himself as the Bread of Life. First Jesus gave the “natural” message. Then He will give the “spiritual” message that He is the Bread of Life. The Bread of God is accessible to everyone! Jesus is fulfilling this in the multiplication of the bread in the New Testament. All that Jesus did should have been recognized by the teachers of the Law and the Prophets as the fulfillment of the Older Testament scriptures. These religious leaders were well-schooled in the Older Testament scriptures. As God did more than Elisha could have hoped for or asked, Jesus did more than His disciples could have hoped for or asked. After Jesus multiplies the bread and fish, He announces that He is the Bread of Life. After the people saw the miraculous sign that Jesus did, they began to say, “Surely this is the Prophet who is to come into the world.” John 6:14 They are speaking about the prophet Moses spoke of in Deuteronomy 18:15. “The Lord your God will raise up a prophet like me from your midst, from your brethren. Him you shall hear.” God through Moses had promised the Jews this. Jesus is indeed that Prophet, but He is far more than just a prophet. 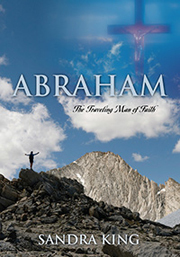 He is the Supreme Prophet of God as the very Word of God, and the Only Son of God. God reproduced is God! Jesus, who is all-knowing, was aware that the crowd was going to come and make Him king ahead of God's timing so He withdrew to a mountain by Himself. He will go and commune with the Father alone.